I stand across the street from the bookshop, reading the now familiar words painted on the plate-glass window, “Serious Books, New and Used, Melissa Serious, Proprietor.” In my pocket is a note from Ms. Serious delivered to me by Thalia, who spends her entire book allowance at Melissa’s. When the traffic ebbs, I cross over. “Ah, I knew Thalia would not fail me.” Melissa raises her eyes from her book and smiles at me. I happily relate it to her. In Three Feathers, a king contemplates which one of his three sons should inherit his kingdom. He proposes that whichever of the three can bring him the finest carpet will succeed him. He casts three feathers into the air. The eldest son follows his feather to the west, the middle brother follows his to the east. The feather intended for the youngest brother, Simpleton, immediately settles to the ground, followed by heartless derision from his brothers. Sitting on the rock upon which the feather has fallen, intending to have a good cry, he discovers under it a trapdoor and steps leading downward. In an underground chamber he finds a large toad surrounded by little toads. When Simpleton tells the toads of his plight, he is given a beautiful carpet. Meantime, his brothers take the easy way out and bring back the first carpet they can find. When they see Simpleton’s carpet, they protest that their youngest brother cannot possibly be king and demand another contest. The king obliges and sets them the task to find the most beautiful ring. He casts the three feathers that float and fall as they did before. Simpleton returns to the underground chamber where the toads lives. The brothers go no farther than they possibly need to, returning with old wagon rings. The contest ends like the first. Again, the elder two brothers protest and the king now calls for them to go out and return with the most beautiful woman. The three feathers are cast. This time the large toad gives Simpleton a hollowed-out turnip to which are harnessed six mice. Simpleton picks out one of the little toads and puts it into the hollow turnip. In an instant the tiny conveyance transforms into a carriage pulled by six horses and carrying a beautiful woman. The brothers, having learned nothing, return with pretty peasant girls. Again, there really is no contest, but still the brothers protest, issuing a challenge that the kingdom should go to the brother whose woman can jump through the hoop hanging from the hall ceiling. The elder two think Simpleton’s woman is far too delicate for the task. Instead, the peasant girls injure themselves in the attempt, and the enchanted woman springs through with grace. The protests come to an end. I see Melissa’s green eyes smoldering and wonder what terrible thing I’ve said. “Oh, I’m sure they didn’t have circus animals doing such tricks then.” I am not really sure. “Oh.” I am embarrassed. I didn’t see that implication. “Oh,” Melissa says, “about the note . . .” She turns in her swivel chair to a pile of books with paper tabs sticking out from between their pages with various messages written to herself. The paper tab in the book she hands me has “For Thalia’s G-dad” written on it. “I know you will buy this volume.” Melissa is one tough saleslady. I look at the book’s title and I know she is right. “When did this come out?” I am delighted. I am holding The Original Folk and Fairy Tales of the Brothers Grimm: The Complete First Edition, translated by Jack Zipes. “Zipes, of course. This is wonderful.” I turn immediately to Three Feathers and read. I am stunned. I can’t help noticing Melissa’s smile at the shock that must be registered on my face. “He changed it,” I blurt. “He, who?” Melissa is enjoying my befuddlement. “Wilhelm. Jacob left Wilhelm to handle the fairy-tale project while he worked on a German dictionary and other things. The Tales went through seven editions and I read that changes were made from the first in 1812—this edition,” I tap the book in my hand, “and the last in 1857, but good heavens. “’Listen, in the original the tasks were to find the finest linen, then the finest carpet, and finally the most beautiful woman. That’s not that big a change. However, in this version the two elder brothers make an honest effort to find the best, but cannot compete against magical help. “Next, the time Simpleton spends underground is different than time passing above ground. He goes down the stairs, gets the linen, and climbs back up the stairs. Meanwhile, his brothers have been traveling far and wide in their search, and are just now returning. “Here’s the real kicker, there is no toad in the original. In his first visit, Simpleton finds a maiden in the subterranean chamber sitting at a flax wheel. She gives him the finest linen ever seen. On the second visit she is at a loom making an enchanting carpet for him. “I know the difference,” says Melissa. “The frog says, ‘Embrace me, and immerse yourself!’ She says this twice before the reluctant Simpleton picks her up, takes her back to the upper world, and jumps into a pond. The moment they hit the water she transforms, in his arms, into the most beautiful woman. “Oh, I love that.” Melissa claps her hands. Melissa laughs at what she takes to be my little joke. Actually, it’s a slip of the tongue. I hand her my credit card. Back in my study, in the company of a glass of wine, I am reading my new book looking for clues as to why Wilhelm made the changes that he did to the Three Feathers. I know the Grimms started out (and remained) loyal to the idea of the German nationalistic spirit being embedded in the language, leading the brothers to study philology and mythology instead of the law, their original academic intent. Yet—from what I am reading now and what I have read before—I gather that they shifted their focus to include practical concerns. Their first collection of fairy tales, appearing in two volumes published in 1812 and 1815, was met with lackluster interest. By the second edition in 1819, Wilhelm caught onto the notion of making the work presentable to children. The scholarly notes went away (published separately) along with mothers who killed their children. Stepmothers now killed the children. Christian motifs replaced some of the pagan motifs, but thankfully not all. 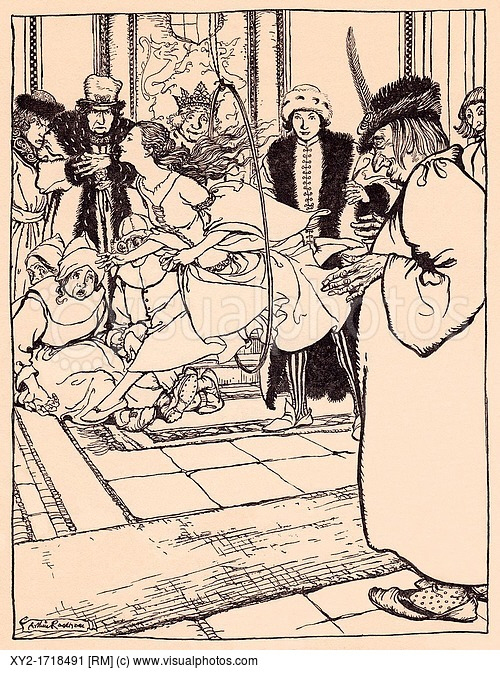 In 1825 the Grimms published a small edition of fifty stories intended for middle-class families with children, a rising segment of the population who might—and did—purchase the book. I can well imagine the dilemma as they attempted to reconcile the idea of the tales as a nationally unifying heritage with the actual tastes and mores of broad swaths of the German population of the day. Using this knowledge I conjecture why Wilhelm made those particular changes to the Three Feathers. I reach for my glass and take another sip. Wilhelm is standing by the fireplace glazing into the flames. Dropping the linen and substituting a ring as one of the tasks is minor. A ring is more interesting than a piece of linen. However, in both versions I find the request for a carpet rather odd. Unless it flies, a carpet is uninteresting. Rings and beautiful women have ambiance. In the Grimms’ notes they cite a variant in which the king requests a dog small enough to jump through his wedding ring. That stopped me in light of Melissa’s comment about dogs, kings, and hoops. There may be a cultural reference in the story, now lost on us. More notable is the change in the elder brothers’ nature. In the original version they diligently pursue the king’s requests, but lose out to Simpleton’s magical helpers. I assume that did not appeal to the current work ethic of their audience. Wilhelm denigrated the elder two brothers to justify the younger’s success. Now that the two lazy brothers spend little time on their tasks, a time difference between the upper and lower realms no longer makes sense; Wilhelm sacrificed it. I glance up at him. He is watching me and nods, reading my thoughts. 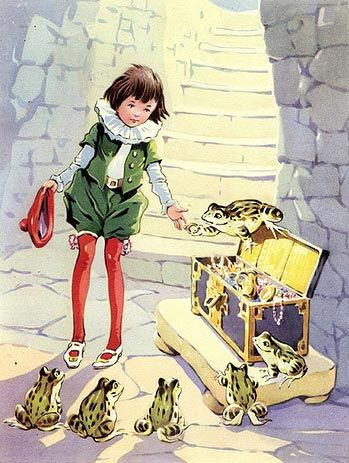 Curiously, Wilhelm replaced the maiden and frog with toads. I’ll admit, the toad version is tidier. 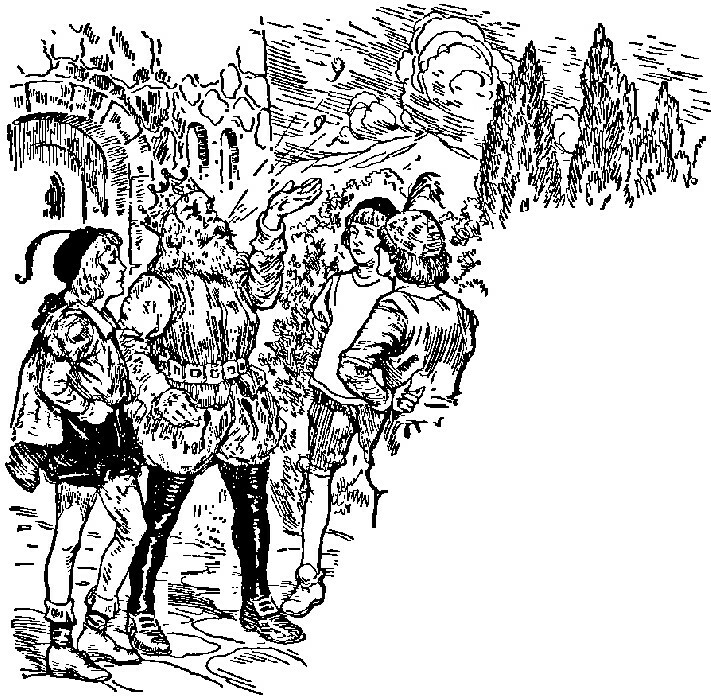 The Simpleton comes to the same place three times for the toad to grant his wishes. In the 1812 version, on the third visit he travels deeper into the subterranean world to encounter something uncanny. I wonder if Wilhelm feared his Protestant readers might view the scene of Simpleton jumping into a pond with the frog for the sake of transformation as a mockery of the Christian baptism, and opted for the obviously more fanciful—and literary—version in which common creatures and objects turn into the glamourous in the blink of an eye. I look up, Wilhelm has vanished. The wine has made me sleepy and I put down the book. Like the wine, this English translation of the Grimms’ first book is a thing to savor.